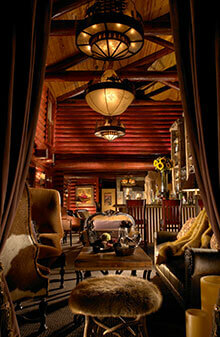 The Spa at Rustic Inn is an oasis from the demanding recreational activities of the exquisite Jackson Hole area. This full-service spa includes over 2300 square feet of beautiful treatment rooms, a luxury couples massage room featuring a large soaking tub, DermaSound Elite facial system, a dry sauna, and a one of a kind eucalyptus steam room. Our experienced therapists and technicians use only the finest product lines available. 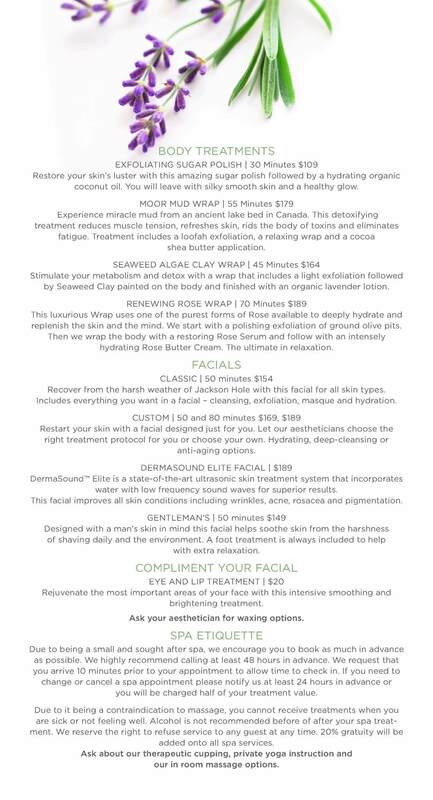 Take a vacation from your vacation and come enjoy Jackson’s paramount Spa. *The Rustic Inn Spa will be closed from October 21st to December 5th. Our sister property, the Lodge Spa, will be open, please contact 307-413-7900 or email TheLodgeSpaJH@gmail.com for appointments during this time. Due to being a small and sought after spa, we encourage you to book as much in advance as possible. We highly recommend calling at least 48 hours in advance. We request that you arrive 10 minutes prior to your appointment to allow time to check in. If you need to change or cancel a spa appointment please notify us at least 24 hours in advance or you will be charged half of your treatment value. 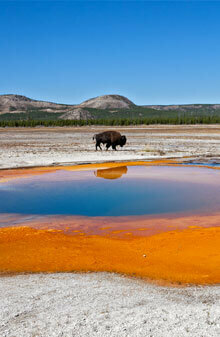 Please refrain from receiving treatments when you are sick or not feeling well. Alcohol is not recommended before of after your spa treatment. We reserve the right to refuse service to any guest at any time. A customary gratuity of 20% will be added on to your treatments, this can be changed at your discretion. 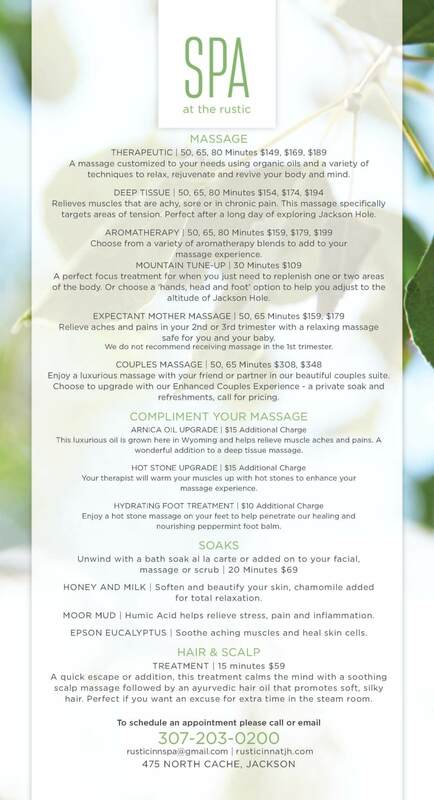 For additional information, please contact 307-203-0200 or email rusticinnspa@gmail.com.